The Glemseck 101 festival is on again this weekend in Germany and it’s geared up to be bigger than ever. This year there’s been a lot of hype surrounding what is arguably the highlight of the show, the Glemseck 1/8 mile sprints. The custom builder class, named ‘Sultans of Sprint’, is definitely a stand out for me, but there are also a few other rather interesting classes being run. There’s a cafe racer category, rigid frame class, pre-1983 motorcycles and the ‘Essenza – Essence of Motorcycles’ class that is open to any twin cylinder bike under 1200cc. 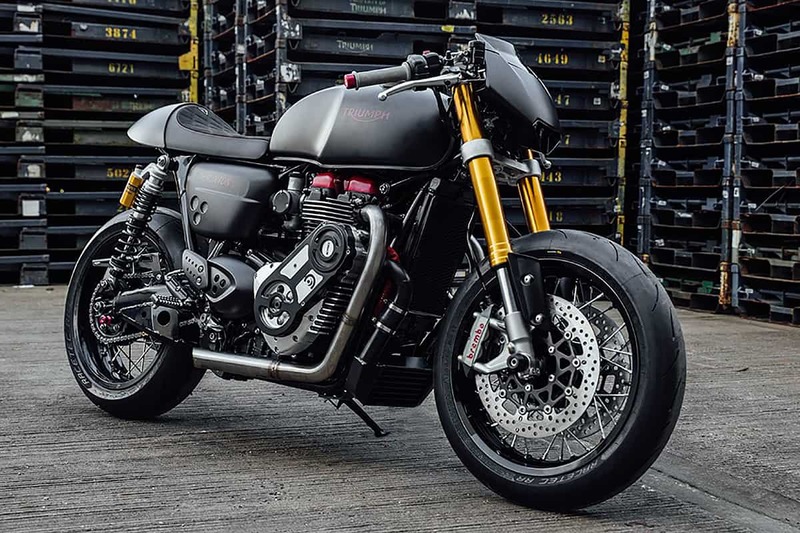 As one of the major sponsors of the Glemseck festival Triumph Germany have seized the opportunity to compete in the Essenza class by building two rather brutal custom versions of their recently released T120 Thruxton R.
The bike you see here has been named ‘The Bulldog’ and it’s the more sinister looking Thruxton R of the pair. Aesthetically the Bulldog has an air of streetfighter about it while still retaining elements of its retro cafe racer styling. 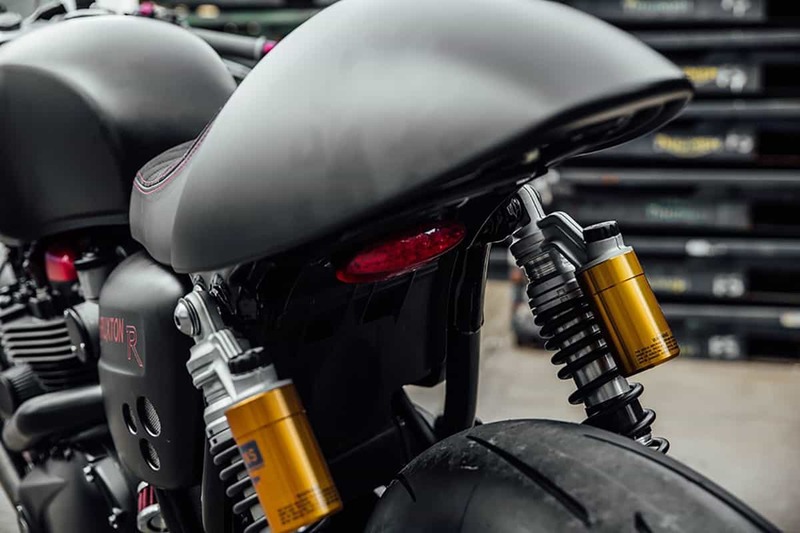 The team at Triumph Germany have discarded the Thruxton’s classically styled headlight in favour of a front fairing repurposed from their 2016 Speed Triple R. To adibe to the events ‘road-legal’ rule they’ve integrated an LED headlight into the unit that’s tucked neatly into the air ducts in its base. The menacing satin black and blood red paint scheme does wonders for the Bulldogs threatening demeanour, and there’s a colour matched seat and blacked out rims that have come straight out of Triumph’s aftermarket catalogue. However menacing the Bulldog may appear, it’s the bikes performance modifications that should really be making its competitors nervous. 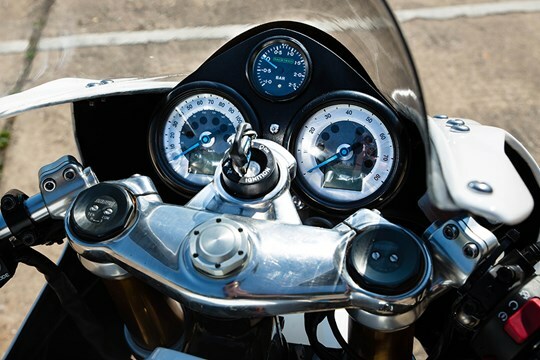 Triumph have managed to generate an incredible 60% more power from their all new 1200cc, water cooled parallel twin. How is such a huge increase in power possible you ask? Well that’s simple, you just have to bolt a whopping great big blower to it. 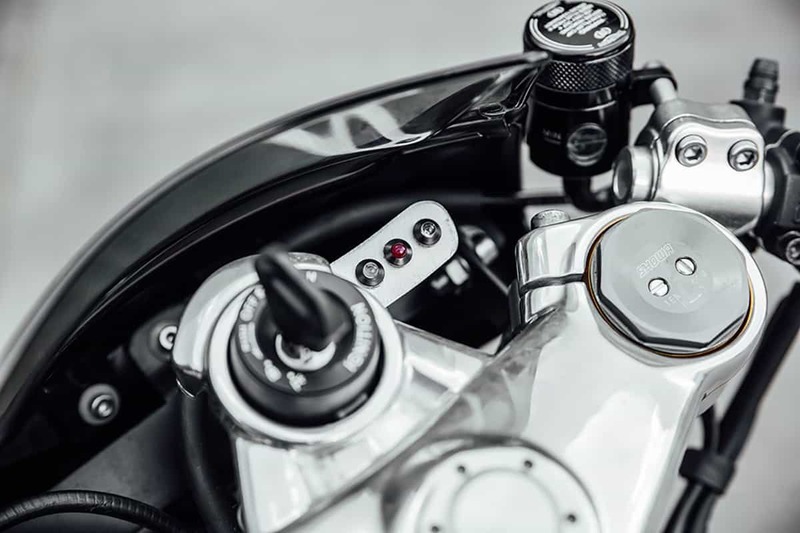 Hanging off the right hand side of the Bulldog’s T120 engine is a Rotrex supercharger. In a nutshell, the supercharger kit increases the amount of oxygen available during combustion to produce a better fuel burn and in turn, loads more power. 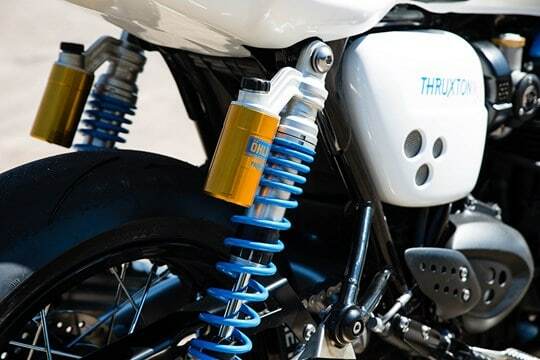 To keep temperatures and pressure in check there’s an intercooler slung beneath the Thruxton’s radiator and a blow off valve. If it’s numbers that really get you excited. The 60% increase equates to a jump in power from 96bhp to an impressive 139bhp and boosts the torque figure up from 112Nm to 157Nm. With all that extra power and torque on tap I think it’s safe to say that bikes traction control is going to have its work cut out for it! 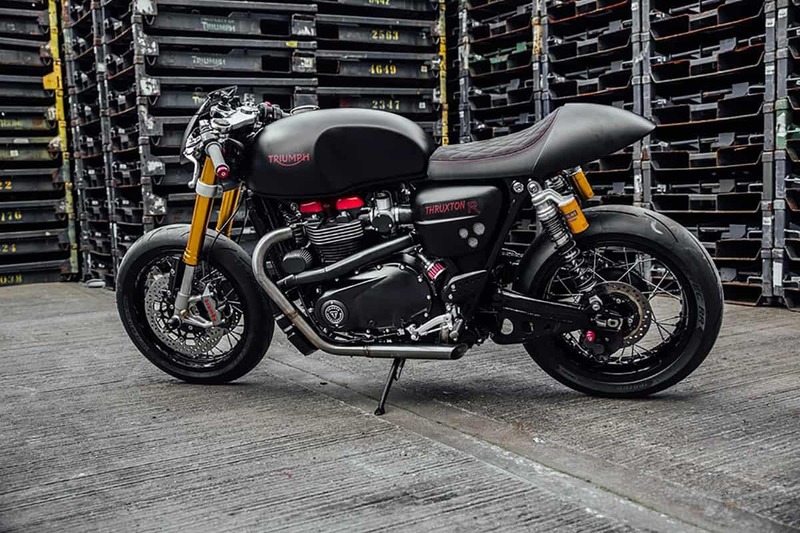 Along with the supercharger kit Triumph have also pieced together a custom, twin pipe exhaust system that looks to have little regard for European noise emissions. To handle the extra power at the rear wheel they’ve also added a braced MotoGP swingarm and wrapped the rims in extra grippy Metzeler Racetec RR road racing rubber. The Bulldog’s tail end has also been cleaned up with new LED lighting and a tail tidy and the top clamp has been modified to hold nothing more than a couple LED warning lights and the ignition barrel. To help pilot the bike to victory Triumph have enlisted motorcycle critic and journalist Christophe Lentsch. All of the races will be wrapping up today so if you head over to the Glemseck 101 facebook page this week you’ll be able to see how they placed. 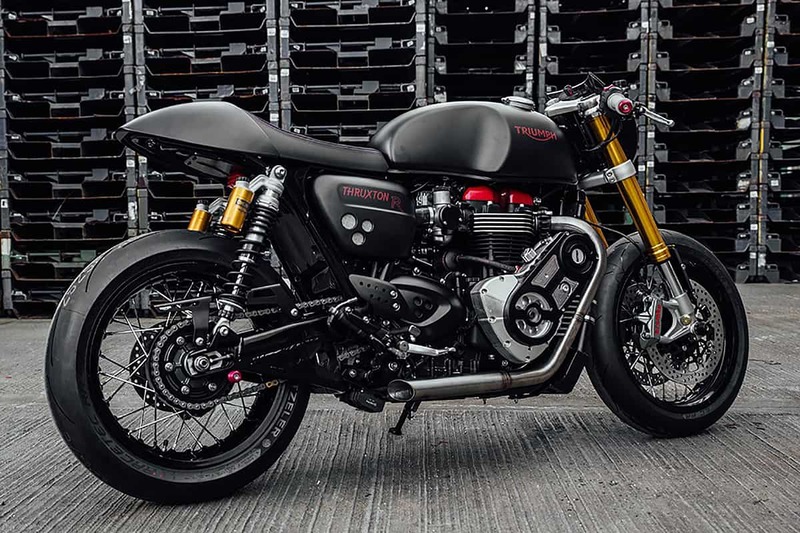 Triumph Motorcycles have entered two stonking supercharged Thruxton R bikes in the ‘Essenza – The Essence of Motorcycles’ challenge races that take place tomorrow, September 3 at the Glemseck 101. 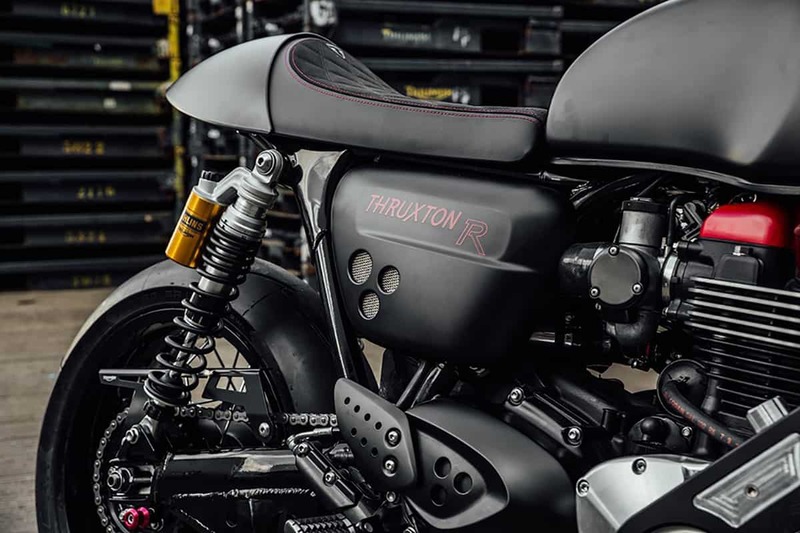 The first is a sleek marriage of modern racing lines with a classic T120 parallel-twin heart, the second a dark brooding retro street fighter. 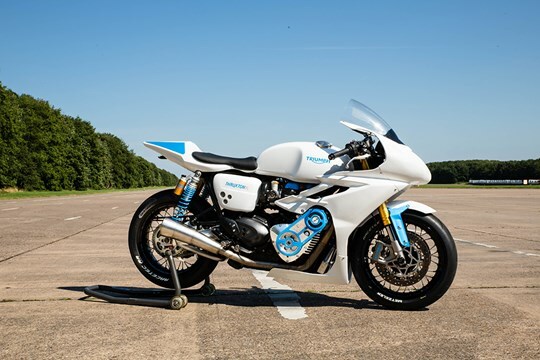 ‘The White Bike’ which will be ridden by Triumph Global Ambassador, Carl Fogarty, while the ‘The Bulldog’ will be ridden by Christophe Lentsch from 1000ps. 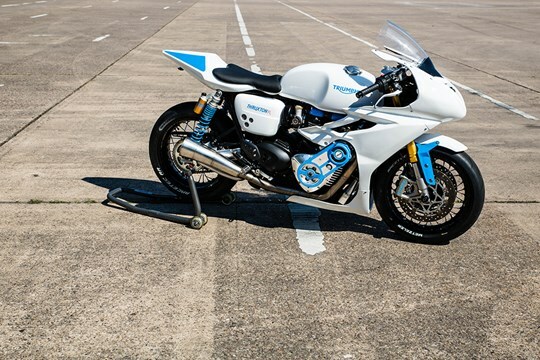 The White Bike’ gets some aerodynamic efficiency from its Daytona 675R fairing and seat, while it also gets a braced, MotoGP-inspired swingarm has been hand-crafted in the factory and revised gearing helps to feed the power to the tarmac. ‘The Bulldog’ is more brutal. 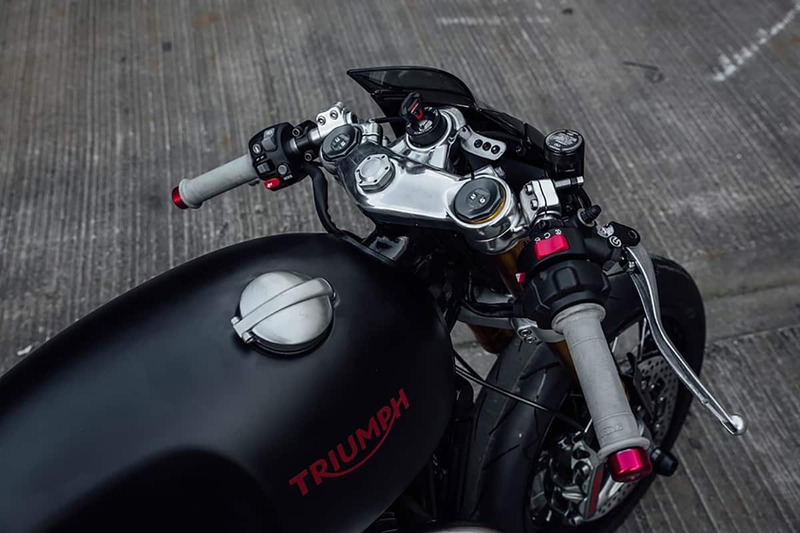 It also gets a deep-braced swingarm, with the front dominated by a custom Speed Triple R intake fairing, repurposed to house the LED front lights. Final detail touches include the factory-accessory seat and matching factory-accessory black wheels. I wouldn’t mind slinging my leg over the damn thing and see what its all about thats for certain.